The 9 Converts Former Bank Vaults of Cleveland Elite into Prohibition-Era Cocktail Bar, Vault. 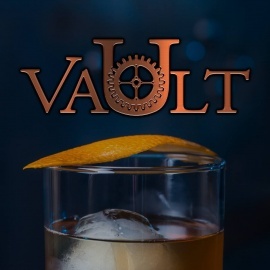 Located in the basement of the former Cleveland Trust Rotunda, there are four historic bank vaults that have been transformed into prohibition-era cocktail bar, Vault. Inside each extremely large, circular steel-and-glass doors, there are safety deposit rooms that formerly belonged to famous Clevelanders. Locals and guests of Cleveland will enjoy a one-of-a-kind cocktail experience. During the week, Vault at The 9's high-energy lounge and Speakeasy can be used for meeting rooms. Completely separated from Vault, there is the exclusive Speakeasy. It is invitation-only, and will only cater to Cleveland's elite.